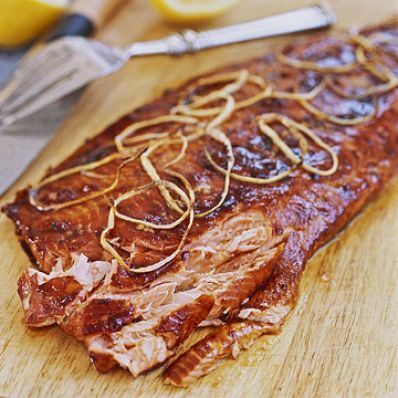 Marinated with a sweet spice rub, brushed with sweet-sour plum sauce, and smoked until flaky, this salmon fillet possesses a delightful mingling of great Asian flavors. 1 of 3 Rinse and pat dry salmon fillet. Place on a large glass platter or dish. 2 of 3 In a medium-size bowl, combine the sugar, salt, garlic powder, 1 tablespoon of the ginger, 2 teaspoons of the cloves and 2 teaspoons of the cinnamon. Press sugar mixture, about 1/4-inch thick, onto the fleshy side of the fillet. Cover loosely with plastic wrap and refrigerate for 2 hours. Meanwhile, soak wood chips in warm tap water. 3 of 3 Remove fillet from refrigerator. Rinse off rub under cool running water. Dry with paper towels, and let stand at room temp for 20 minutes. 1 of 3 Fire up about 7 to 10 pounds charcoal briquettes in bottom of grill. The charcoal is ready when gray and ashy. Reassemble grill, water pan and bottom grate. Pour at least 8 cups hot water into the water pan. 2 of 3 Meanwhile, stir the remaining 1/2 teaspoon each of the ginger, cloves and cinnamon into plum sauce. 3 of 3 Spread the onion slices onto a disposable foil pan or heavy sheet of aluminum foil large enough to hold fillet, but small enough to fit into smoker. Place fillet, skin side down, on top of onions. Spread top of fillet with plum sauce. Place salmon in heated smoker on top rack. Cover grill. Shake excess water off chips; add to charcoal through side door. Cook for 1-1/2 to 2 hours, or until flesh flakes easily with a fork and registers 140 degrees F on an instant-read thermometer. Top fillet with onions from pan, if desired.